Paul and Lindsay began their aviation careers at the University of North Dakota, graduating with degrees in commercial aviation. They quickly moved to Duluth, MN to provide Cirrus transition training to new aircraft owners as factory instructors. Together, they have accumulated in excess of 7,500 hours of total flight time, 6,000 of which are in Cirrus aircraft, and 5,000 as dual given. 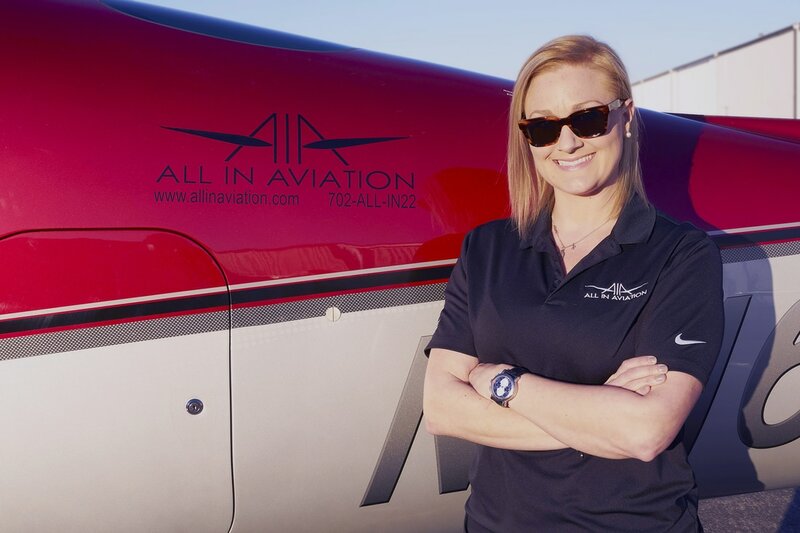 ​Tess joined the All In Aviation team in January, 2017. With a bachelor's degree in Communications from UNLV, she has an extensive background in customer service and marketing. Tess moved from Los Angeles in 2006 and currently lives in Henderson with her two daughters. ​She is excited about becoming proficient in the world of aviation and has recently taken her first flight lessons in a Cirrus. Her focus is to provide our clients with top notch service! ​Brandon moved to Las Vegas after earning his degree in Economics from James Madison University in Virginia. He was working as a Project Manager for a local pool construction company when he took his first private pilot lesson for fun. After just one lesson, he knew that he needed to make a career change. Brandon completed training at a 141 program in Las Vegas and instructed there after reaching his CFI. He has extensive training in glass cockpits throughout the Las Vegas valley. Brandon loves sharing his passion of flight with his students and helping them to achieve their goals. His hobbies include traveling, running, hiking, and golfing. Alex took his first flight on his sixteenth birthday and loved every minute of it. He started his pilot training while still in high school, and continued with advanced training in Ogden, Utah where he earned his certificates and ratings. Alex worked as a flight instructor in Salt Lake City before deciding to leave Utah for the warmer weather here in Las Vegas. When not in the air, Alex enjoys being outdoors in the mountains and lakes and spending time with his family and friends. ​Alex Volker originally born in Grand Forks, North Dakota and raised most of his life here in Las Vegas, Nevada started flying lessons at the age of 12 years old. Alex started his flight training in a Cirrus SR20 and received his private pilot’s license in high school at the age of 18. He then continued on to the University of North Dakota, graduating with a Bachelor of Business Administration in Aviation Management. Alex has served as a flight instructor and stage check pilot at Part 61 and 141 flight schools. To date, he has accumulated around 2,000 hours of total flight time and 800 hours of dual flight instruction given. Currently, Alex is a corporate pilot and manager for a flight department here in Las Vegas and is thrilled to be back instructing in Cirrus Aircraft. ​Ryan Lindley started flying as a teenager through the Rancho High School program out of North Las Vegas Airport. He continued his aviation training at the University of North Dakota and graduated with a Bachelors of Science in Commercial Aviation. Ryan has served as an assistant chief and a check pilot at a 141 school, and has accumulated around 2,000 hours of total flight time and over 1,000 hours of dual flight instruction given. Currently, Ryan is a corporate pilot and chief pilot for a flight department in Las Vegas and still loves to teach on his free time! Jeremy is a fifth generation native Nevadan who entered into aviation as a career change from the IT world of Apple Computers. In 2009 Jeremy moved to Las Vegas and began flight training. He has since accumulated more than 4,500 hours of total flight time, nearly 2,000 of which are in Cirrus aircraft, and has over 3,500 hours of dual given. Jeremy has served in Assistant Chief and Chief Flight Instructor roles at part 141 flight schools, and has flown more than 50 types of aircraft large and small. He is returning to general aviation after flying commercially in Medical Transport, and is very excited to lead All In Aviation's flight department in offering the most modern, high performance, attractive aircraft rentals and training in Las Vegas. An avid aviator since he bought his first airplane, a Cessna 172, over 40 years ago, Mike has flown over 8,000 incident-free hours, including more than 5,000 in his favorite airplane, the Cirrus. He bought his first, an SR20, in 2001, and his second (and last, he says), SR22 N1MR, in 2003. A founding member of the Cirrus Owners and Pilots Association (COPA), Mike became its President in 2002 and President Emeritus in 2007. Mike and his wife Lillian are the proud parents of Max and Ilana. In a “previous life”, Mike founded a technology company based on technology he developed. He took the company public in 1984, and retired in 2000.